I used to admire MA students when I was in college. I was like "ang gagaling naman nila..ang tatalino siguro ng mga 'yon." That is why after finishing my undergraduate degree in Clinical Psychology, I grabbed the opportunity to start my journey at the graduate school. However, deciding to take the Master's degree is not that easy. Of course, you have to consider a few things because it is a commitment too. It took me 2 years to decide to push myself into a Master's degree. I have to consider first my time. Can I work and study at the same time? Followed by my financial expenses. 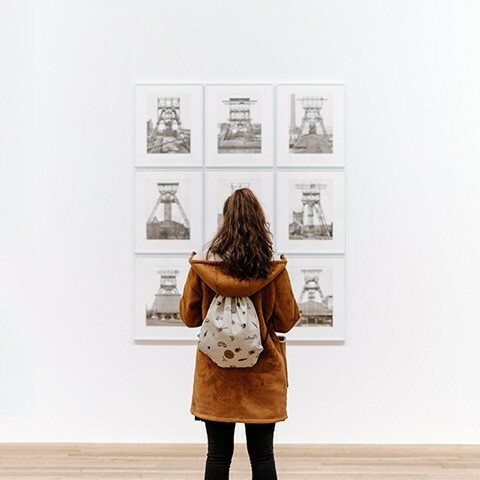 Could I afford a Master's degree amidst my list of expenses? Then, the opinion of my family and friends. Yes, it may not be important because I was the one studying not them but their opinion matters too. Then, I have to ask myself. Am I really ready for this? Do I want to invest more time into studying? Moreover, I have to weigh in the reasons why I want to have a Master's degree. I asked myself why? You have to have a justifiable reason para along the journey you can use it as your motivation. 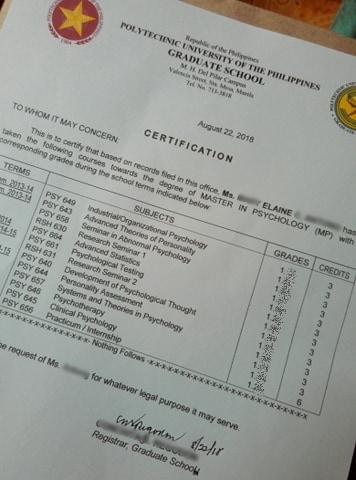 Honestly, the first reason why I took up a Master's degree is because I needed to earn units in a subject included in the licensure exam (I/OP). But as the semester went on, I realized that I was enjoying it. I want to start a Master's degree because I want to experience what MA students are experiencing. I want to know their struggles as a student (who is also working at the same time) and I want to learn what they have learned. I want to study Psychology in a much deeper sense. I want to put what I have learned on the undergraduate level into practice. I want to gain more training. I want to earn a Master's degree because I want to test my skills and knowledge in Psychology. I want to prove that I am on my way towards achieving my dream of becoming a Psychologist. In short, I just wanted to build up my resume and add up a Master's degree after my name. Haha! 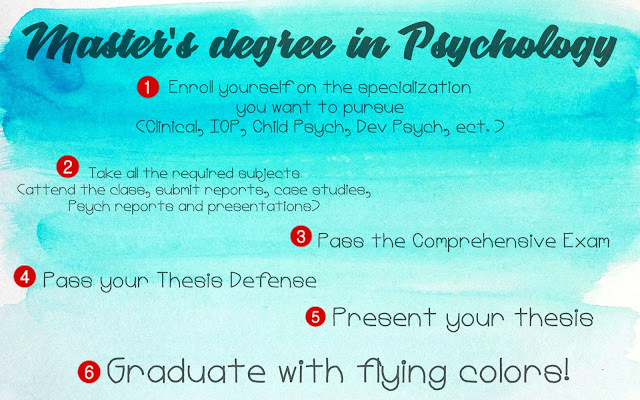 But seriously, a Master's degree is a more in-depth way of studying Psychology if you really want to pursue a career in Psychology. 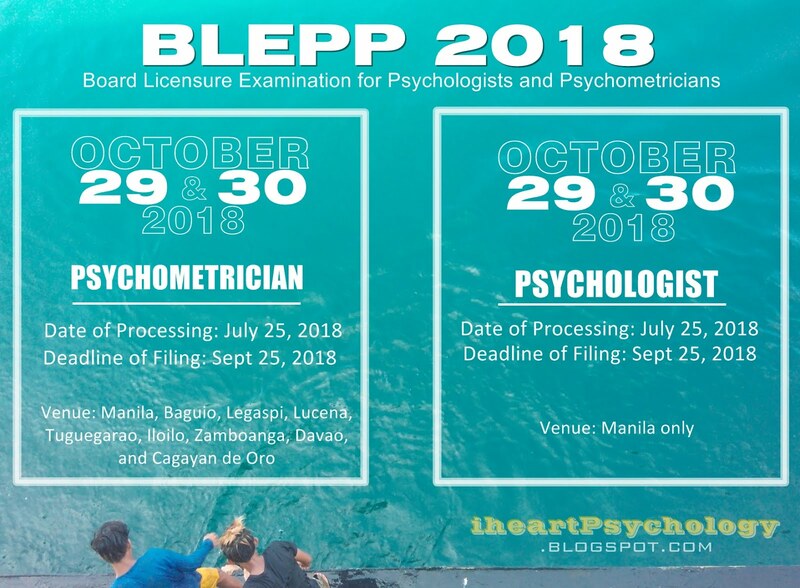 There are a lot of universities offering an MA in Psychology, some also offer MS in Psychology while PUP Graduate School offered Master in Psychology which is where I was studying right now. At the graduate school, you will learn a lot from your professors and most especially from your classmates. Because most of the time you will have class reports and discussions. You will also do a lot of research work and consultations so it would really occupy your time. And just yesterday, I was able to see the fruit of my hard work. Yey! I am so thankful! I am only three steps away towards my Master's degree! I can't imagine how I was able to pursue it despite of all the challenges I have to encounter at work just to insist attending my graduate school classes. I have to leave my first job because they would not allow me to attend my weekend classes regularly. Then on my 2nd job, I was not able to enroll for 3 semesters because of conflicting schedules and my supervisory position. But luckily, I was able to pass all the required subjects and now I got to see the Certificate of Grades. I was so overwhelmed. God helped me through it. I remembered those days when I have to pray at the bus because I came from half day work just to present my report in front of the class. "Lord, please sana wala pa po yung prof ko para makapag-prepare ako ng maayos bago mag-report." "Lord, tulungan nio po ako...sana po umabot pa po ako sa klase. Sana po hindi traffic." Ahhhh... those days were really stressful. And now, after 5 years, I have completed all the required subjects which made me eligible to take the COMPREHENSIVE EXAMINATION. I am so happy! This is like a qualifying exams to test all the knowledge you have gained before starting up your THESIS WRITING. Yes! There is a thesis writing (ugh! the sad truth). And it is the most important subject before you can have your Master's degree title. Right now, though I finished the required subjects I am not done yet. Because I have to pass the exams first before I can move on to Thesis Writing which will cover another semester depending on the scope of your study. Yes! That will be tough! But I know I can do it with the help of God and my family. I am currently on my fifth year at the graduate school btw. Because I only took 2-3 subjects per semester since I also have work on Saturdays, and classes at the graduate school are limited to Saturday and Sundays only. Hopefully, I can pass the Compre exam and go into thesis next semester. That's my current journey towards my Master's degree in Psychology. How about you? 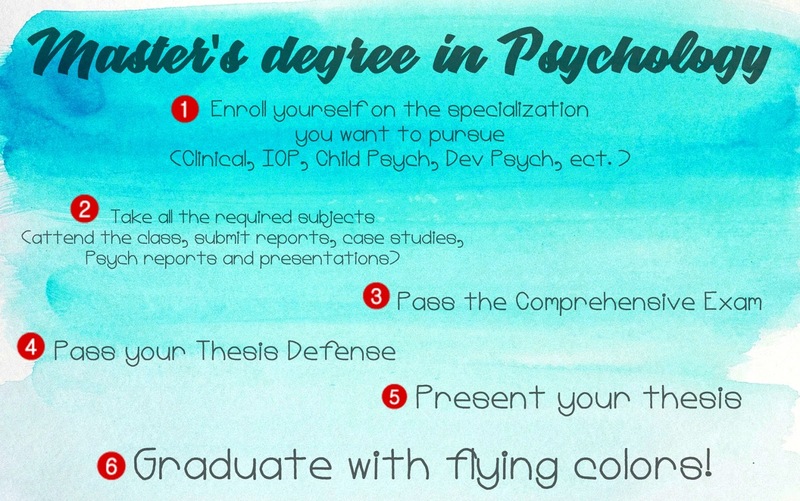 Are you also taking up a Master's degree in Psychology or planning to? Share with me your struggles at school and let's inspire other Psych majors out there!